Remember hearing about – or worse, feeling like – people seeing ads related to topics they’ve merely talked about with friends on the phone or in person? Facebook has previously denied the claim that it eavesdrops on you through your phone’s mic to target ads, and other studies have also substantiated that the social network might not be spying on you after all. So, when you see an ad for something you don’t recall searching for online, where does it get data about your interests from? You might already know that Facebook targets you with ads through various means: tracking your liked pages, collecting information about your web browsing habits, and using third-party database of customers. Oh, and even if you don’t have a profile on Facebook, the company might have some information about you – so if you sign up on any of its services, Facebook can serve you relevant ads. Until now, Facebook only told you that you were seeing a particular ad because you matched a certain-ad targeting criterion, like being located in the central business district of your city, or being interested in PlayStation games. Now, according to a TechCrunch report, you’ll soon additionally be able to learn if your details were uploaded by an advertiser. Once this change rolls out to everyone, users will see if the brand has uploaded your data directly, or accessed a through a third party agency, as shown in the screenshot below. This new policy could help demystify the reasons behind certain ads popping up alongside your Facebook news feed. For people on the social network, that could mean feeling less like their privacy is being invaded and that the company is spying on them. Now, there are multiple ways an advertiser can get its hands on your data. The simplest is, of course, that you’re already its customer, and it has your details on file from when you signed up or made a purchase. Another way is that you shared your info at a mall kiosk or similar promotional campaign in real life, and the agency handling that effort sold your data to advertisers. So if you’re seeing ads about motorcycles on Facebook, it might not be because you like a vehicle brand’s page – but instead, it might be because you answered a question about this while signing into a free public Wi-Fi service. Facebook first rolled out its targeted ad serving platform in 2007; since then, it has added more granular features like hyperlocal and topic-based targeting. In 2012, the company began allowing advertisers to upload a hashed database of customer information, including emails, phone numbers, and Facebook IDs, in order to reach them on the social network. Two years later, the social network rolled out its “Why am I seeing this ad?” feature that informed people about the target criteria used by advertisers to pinpoint them. Now, the revamped function will help people find out which agency uploaded their data. The users will be able to know where exactly the data came from, i.e., retailers, data management platforms, and other third-party partners. 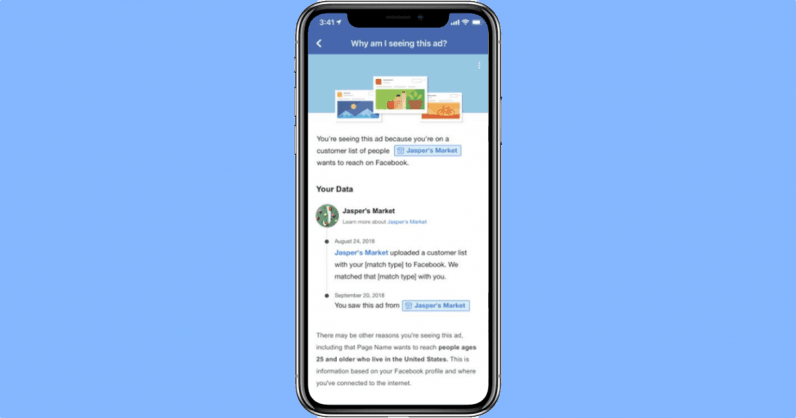 Users will also be able to request that their data be deleted. But legally speaking, these regulations only apply to EU and California state residents; so while Facebook may launch these features as a good faith initiative, its legal liability will be limited to regions where such data privacy laws are already active. That said, you could try fighting back in a small way: once you get the advertiser info, you can always go to your Facebook account’s ad preferences and remove it from the list to stop seeing their ads. Facebook’s repeatedly been in hot water over how it handles customer data. While this step might not improve the company’s image massively, it’s nice to see some corrective steps towards transparency about your data.